Size is deceptive when it comes to the scrub of the mountain maquis. A small tree that may look young can actually be 400 years old. The maquis’ ultramafic soil, which is heavy in metals but poor in nutrients, stunts the plants that grow there. You might think that little grew in the maquis given the soil conditions, but these areas actually have a higher rate of species endemism. The plants of the maquis are adapted to the high metals and low nutrients and thrive, albeit slowly, in the absence of faster-growing, nutrient-hungry plants. 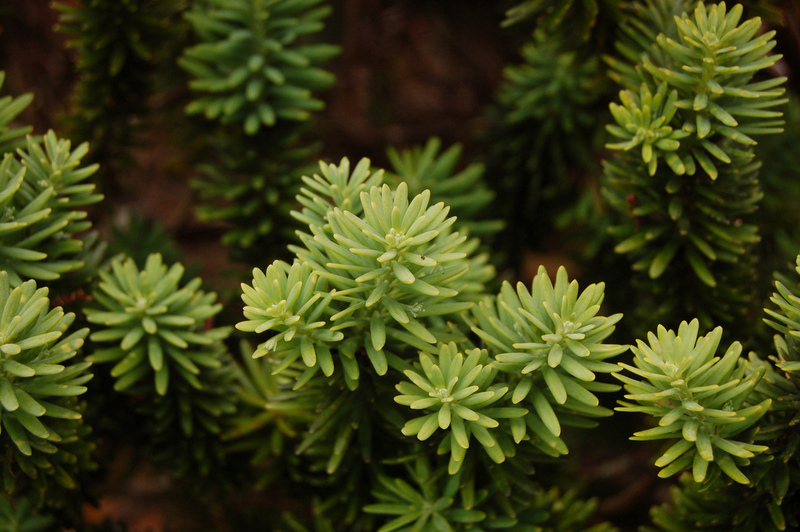 The maquis is characterized by low growing vegetation, heath-like plants, stunted Araucaria trees and plants with thickened (or sclerophyllus) leaves. The maquis is a result of its soil conditions rather than climate and can be found from sea level to the mountainous regions on Grande Terre and nearby islands. Why is New Caledonia’s soil, especially the soil in the maquis, so full of nickel and other metals? The answer has to do with the fact that millions of years ago the island spent a good deal of time submerged in the ocean. Actually, the landmass that would become New Caledonia was not only submerged in water, it was also probably entirely covered by rock from the oceanic crust. When the main island emerged around 37 million years ago, the weathering of these rocks produced soils heavy in metals like nickel, chromium, magnesium, manganese and cobalt, and light on phosphorous, potassium and calcium, the very elements plants need to grow. The plants that grow on the island, particularly in the maquis, have adapted to these conditions. It is perhaps not surprising the an Agathis should be so ubiquitous in the nutrient-poor soil of the maquis. 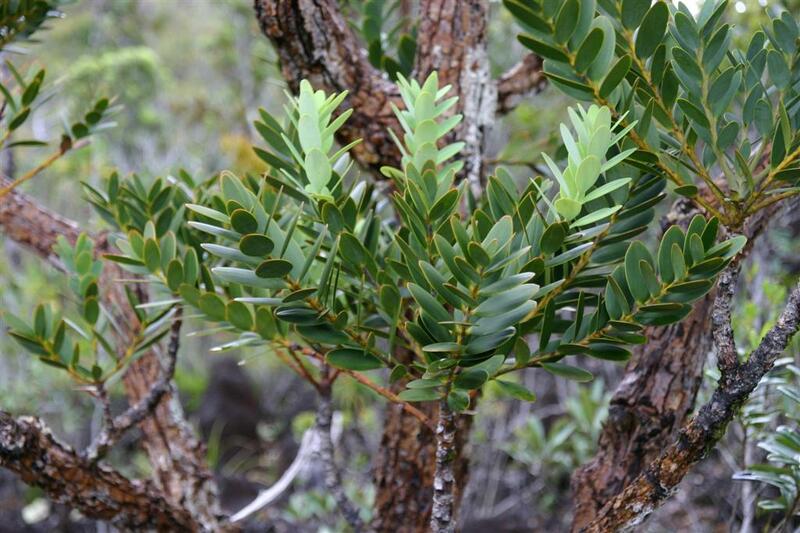 Trees in the Agathis genus are very efficient users of nitrogen and do much growing with comparatively little of this essential plant nutrient. The tree most commonly seen in the maquis is the dwarf kauri (Agathis ovata). The maquis is often visited by fire, and the thick bark of the dwarf kauri helps the tree survive these conflagrations. The dwarf kauri also occurs in the rainforest, where it can grow 80 feet tall. In the maquis, however, its height ranges from 3 to 25 feet. Pycnandra acuminata. The sap is blue because of hyperaccumulation of nickel. Photo © Bernard Suprin. Another fascinating adaptation associated with the maquis in particular is the hyperaccumulation of metals like zinc, chromium, and nickel. These heavy metals are generally toxic to plants, but hyperaccumulators are not only able to grow in metalliferous soils, they are able to take up concentrations of these metals without harm. 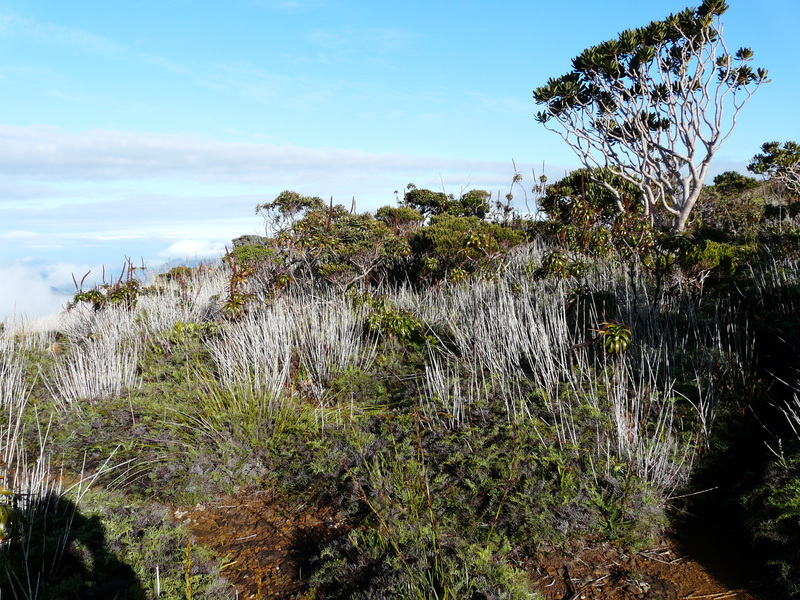 On New Caledonia, whose soils are rich in nickel, there are 65 known species of nickel hyperaccumulators, and more will likely be identified. Many, as you can imagine, can be found in the maquis, but not all. 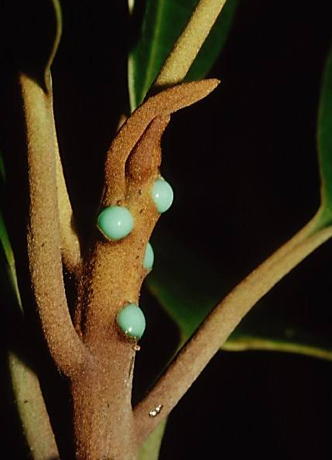 The species pictured to the right, Pycnandra acuminata, is actually more of a rainforest plant, but it is one of the most “hyper” of the hyper accumulators: When measured as dry weight, its latex (type of sap) is 25% nickel. There is still much to learn about the hyperaccumulation process and what benefit it has to the plants. One incentive to do so is that hyperaccumulators could be used to restore mines and other sites contaminated by metals, perhaps actually removing toxins in the soil through phytoremediation. Xeronema moorei (Xeronemataceae) Monts Koghi, New Caledonia. Photo Tim Waters. Grevillea gillivrayi (Proteaceae) inflorescence at Bois du Sud, New Caledonia. Photo Tim Waters.